Outdoor dining never looked so good. When jewelry designer and all around Renaissance woman Jane Pope wanted to show her appreciation to a group of do-it-all Charleston women for championing her creative endeavors over the years, a dinner party was the obvious choice. A stunning outdoor soiree, Pope incorporated pops of color on a neutral backdrop, intricate floral arrangements, inventive cocktails, and a healthy, farmers’ market menu that boasts the bounty of the season. We caught up with Pope to learn all her secrets about how to throw the perfect Southern summer fete, and found out about some very talented ladies along the way. The first rule? Think seasonal, and enlist the help of your friends. Here, Pope walks us through her party-planning process and shares her expert tips. How did you decide to have the party? I threw the party with my dear friend Lauren Lail and my cousin, Way Way Allen, who is an artist. Way Way and I have worked together on many projects and parties, and in different spaces over the years. Lauren and I had three pop-up shops on King Street in Charleston, where Way Way’s art was featured. We’ve also shared studio spaces. All three of us love to entertain, so this dinner was a great excuse for us to work together and have some fun planning. As we were discussing people who have helped us over the years, we thought it would be fun to host a dinner at my house on Sullivan’s Island to give thanks to some of the talented people who have helped us get to where we are today. It was the perfect backdrop for a low key, al fresco dinner. How did you select the menu? We love cooking, but preparing dinner for 20 people was admittedly a bit daunting. We had heard great things about Salthouse Catering and wanted to try them out. The recommendation proved spot on: They were great to work with, and their menu featured local sourcing when possible. It felt more like us to not only be involved in planning the family style menu, but to also prep and serve in our own dishes. The dinner being in the yard of the beach house gave it a casual, cool feel that fit the family style serving. We started with local farmers’ market boards with local, seasonal vegetables and fruit. We kept the dinner menu simple with some of our favorites, like Mustard Roasted Cauliflower, Local Bean Salad, Sorghum Glazed Chicken, and fresh Garlic Shrimp. Toasted Coconut was sprinkled on Chocolate Sorbet for dessert, and we toasted and thanked our guests again with prosecco. How did you pick the drinks? I always like to start with a signature cocktail: We went with a custom cocktail of Hat Trick Gin by local High Wire Distillery, a local botanical gin with fresh grapefruit juice and soda, garnished with rosemary and grapefruit. Dinner was paired with some of our favorite wines and prosecco with dessert. What are your three go-to dinner party tips? Keep it simple: If you’re running around like crazy and stressing, your guests will be uncomfortable. Make it your own. Even if you have it catered and served, be sure you are involved in choosing the menu and making the details special, so that it feels authentic… like you had a hand in it. Throw a party with friends who have different strengths to help lighten your load. Lauren is great with invitations, Way Way is a pro at arranging flowers, and I love planning menus. We worked together on decor: It made for an easy party. What songs are on your go-to dinner party playlist? We went with live music for the dinner. Calvin Taylor is a local musician who is an absolute character and talent. He began with some sitting Otis Redding, and ended with Journey. What is your summer dinner party essential? I have three: a perfect cocktail, delicious food, and amazing company. All boxes were checked. Did you have any unexpected surprise elements? We dressed the table with a little treat from the three of us. Way Way and Lauren worked together on a sarong—it was screen printed, and served as a bit of color on the table. Each was hand-embroidered with the first initial of each guest’s name, in order to denote their seat. I also gave each guest a pair of JPJ Mini Sapphire Baguette Studs, to match the blues on the table. What inspired the decor? Could you talk about the floral moments? We wanted a casual, coastal, cool setup for the al fresco dinner under the trees. We worked with Ooh! 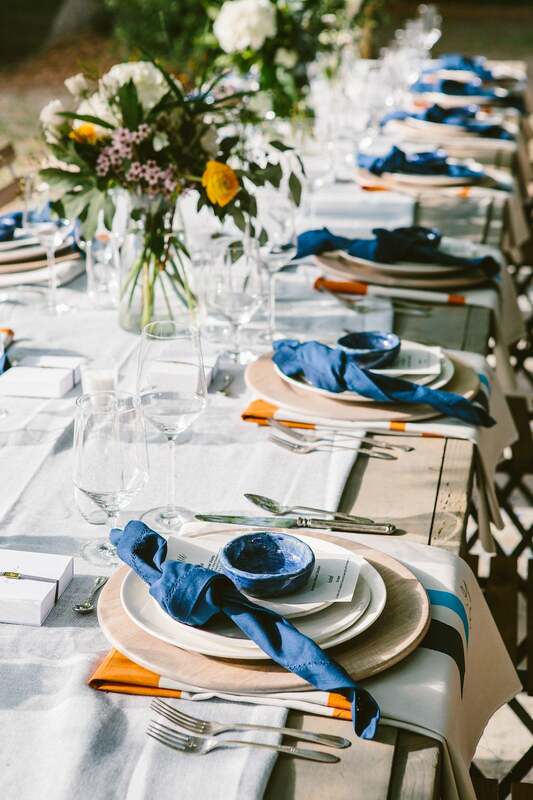 Events and pulled farm tables, dishes in gray/blue hues, and antique flatware. Way Way is a master with flowers: She pulled greenery and hydrangeas from her yard and mixed them with ranunculus, white roses, and eucalyptus. What’s a fun fact about the dinner that you’d like to share? The dinner was at my family home on Sullivan’s Island. There had been a three-day downpour, and we had debated rescheduling, but hours before the dinner, the cloud parted, and it was the perfect evening. How did the space lend itself to the party? Perfectly. We wanted to be under the trees to create an indoor space outdoors. Hanging lights in the trees coupled with moon light made for the perfect backdrop. Can you discuss the dinner planning process, from conceptualizing the theme to your feelings at the end of the night? It only took about a month to plan and execute. We worked with Ooh! Events on all of the rentals: They have an incredible warehouse in North Charleston, with everything imaginable. We chose tables, rugs, chairs, glasses, flatware, plates, and tablecloths that suited the scene. Once we had a clear vision of the setup and the menu, we got the invites in the mail. We made a call to land the infamous Calvin, and then, we were good to go until the day of the dinner. Besides waiting on the mess of a storm for the days leading up to the dinner, everything felt pretty easy.